We recently imported our 2005 Mazda 3, built to California standards, into Canada. As part of that, we had to convert it to have daytime running lights — the headlights needed to stay on anytime the car is running. Why? Safety, it is said; a waste of fuel, it is also said; but the main thing is that C.R.C. c. 1038 Schedule IV Standard 108 requires it, and so we did it. It was almost, but not quite, a simple matter of installing a $40 aftermarket controller module (Hamsar 70987) bought from Canadian Tire. Here’s the lessons we learned that weren’t in the instructions. I hope they will help others installing daytime running lights in a Mazda 3. 1. Getting physical access to the headlight wiring is hard. The module requires one wire each to be attached to the active (+) wire of the low-beam lights, high-beam lights, and turn signal lights. These lights are, on the left side, hidden under a (removable) battery compartment vent, plus various framework pieces of the engine mounting and body front. Attaching the module wire to the existing headlight wire isn’t hard; the kit includes splice taps which makes the wire splicing a simple matter of placing wires and squeezing with pliers. But physically reaching the existing wires, between and behind all that structure, was hard. 2. The trick to reaching the turn signal lights is to go up from below, through the front wheel well. The turn signal lights are nestled under a particularly thick tangle of structural members. I thought I would have to take off the headlight assembly to reach the turn signal light wiring. But no; I found a posting on reparing tail lights which explained the brilliant idea of coming up from below. I turned the steering wheel to the left, moving the forward edge of the left front wheel out of the way and opening room in the wheel well. 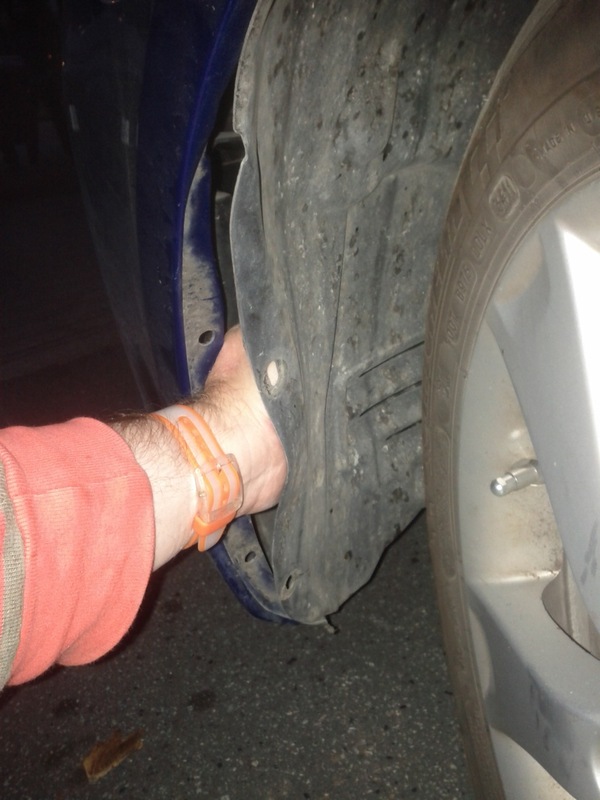 Then I unscrewed the two screws holding the front edge of the (plastic, flexible) wheel well guard to the car body. This allowed me to pull back the wheel well guard, reach my hand up between the guard and the body, and reach the wire harness at the back of the turn signal light without too much difficulty. 3. Mazda 3 spark plug wires don’t reliably trigger this module; you need to attach the wire to a wire with a reliable voltage which turns on only when the car is running. The place to find such a wire is in the wiring patch panel in the middle of the fuze box. The module has a green wire, which controls the module. Put a voltage on this wire (relative to auto-body ground) and the module turns on the headlights. Remove the voltage, and after a few seconds, the headlights go off. The kit suggests wrapping the wire around the spark plug wire, and securing with cable ties. I suppose the idea is that the sparking voltage down the wire will induce a voltage in the wire. I tried this; the result was headlights which were on most of the time, but sagged off during deceleration. This rig failed the import inspection — twice. Note that Mazda 3 spark plugs are wired with two small-gauge conductors, not one thick conductor. I suspect the electrical properties of the Mazda 3 spark plug wires aren’t what the module required. 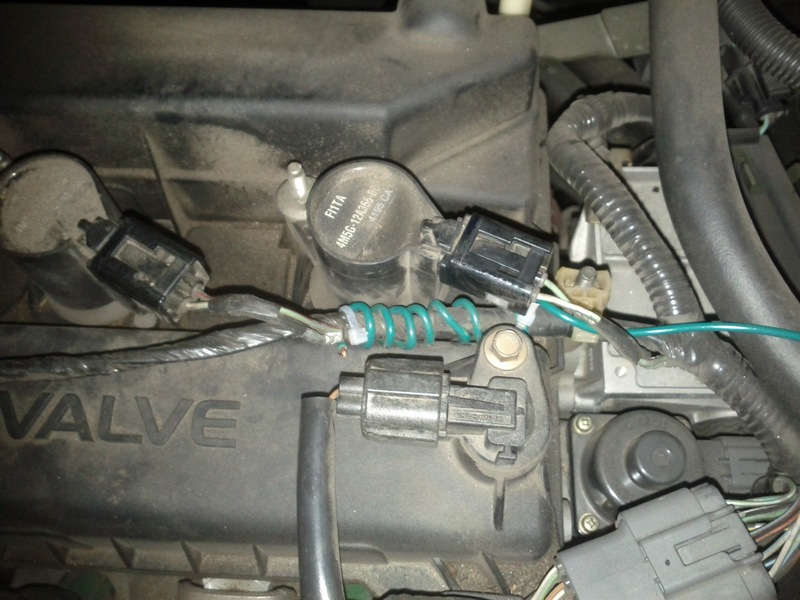 In any case, the green wire, wrapped around the spark plug wires, wasn’t adequate. I was not up for determining which wire in the engine had the right voltage at the right time. So I gave up and went to a mechanic. The mechanic, having done a couple hundred such installations, had no trouble finding a wire in the patch panel which had a dependable voltage. Thus, the lights became reliable. I hope these notes and photos will help other Mazda 3 owners who need to install aftermarket daytime running lights.